Our Remodelaholic motto is builder-grade to beautiful, on a budget. Home renovations start with simple things like paint and hardware changes, but what really takes your home from cookie-cutter to custom are the things that add character and architectural features to your home. We have many skeptics who swear that we must be pulling a fast one, and that our living room can NOT be the same one as in the before pictures. But I promise it is — and that is the beauty of adding statement-worthy features, and what makes it worth all the work to renovate stairs, build bookcases (two kinds!) and add architectural columns and arches. So why am I going on today about all of this? Because today’s guest, Lauren, is SO good at making her home beautiful and stylish, while on a tight budget. She took an average living room and made it sing by adding this gorgeous faux fireplace! And, the best part of it is — she’s here today with ALL the details! Give her a warm Remodelaholic welcome! Hello, DIY warriors! I’m Lauren from Bless’er House, and I’m practically doing backflips over how excited I am to be here today. I blog all about my adventures to make my new basic builder grade house look like a cozy eclectic cottage on a major budget. My little family of three just hit the 1 year mark of living in the Charlotte, North Carolina suburbs. You can check out an entire before and after progress home tour over on my blog. 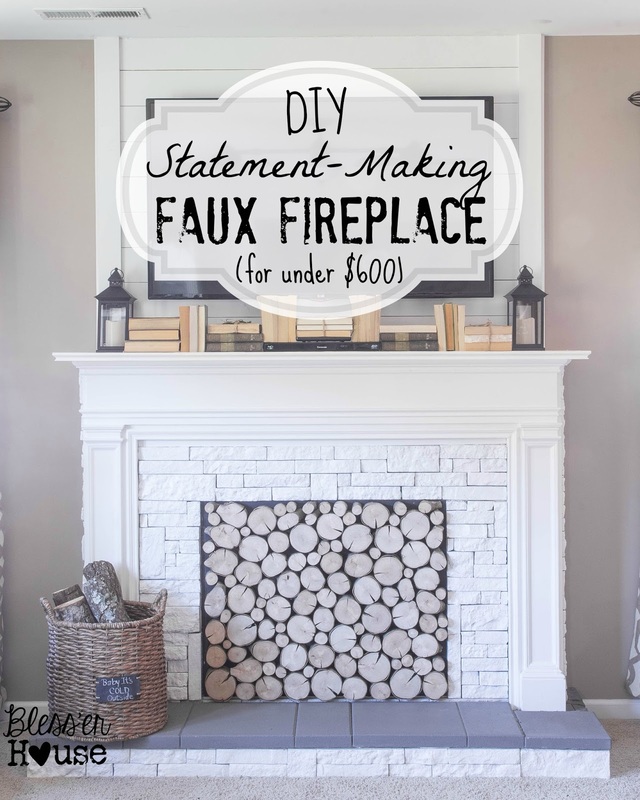 Our biggest transformation of all has been our DIY statement-making faux fireplace that we accomplished for less than $600. I am thrilled to be sharing all of the step-by-step details with you! If you’ve been dying for a fireplace in your home but don’t have thousands of dollars in your pocket, this is definitely the way to go. When we were building our house over a year ago, the upgrade for a fireplace was going to cost $5,000 for a very basic, small fireplace. That wasn’t going to work for our budget, and we didn’t need one in the mild climate of the Carolinas anyway. Yep. We’re starting from scratch, people. Well…mostly anyway. I checked Craigslist for a month or two until I found this beautiful reclaimed mantel from an architectural salvage warehouse. Having the mantel already made helped a lot, and there are plenty out there if you take the time to look. My father-in-law is a whiz at woodworking, so he and my husband mainly did the handiwork. First thing we did was find the center of the wall and decide on the measurements based on the existing mantel front. To frame out the base of the hearth, we cut two long 2x4s about 8 inches longer than the mantel and connected them with shorter 2×4 pieces at 24 inches long. Once the hearth base frame was secure, we lined it up to the center of the wall and nailed the back of the frame to anchor it to the wall. We had thought about cutting a couple of holes in the carpet underneath to anchor it to the floor but decided it wouldn’t be necessary with all of the weight of the fireplace itself. This sucker is heavy and that hearth isn’t going ANYWHERE. If we ever decide to rip up the carpet one day and put in wood floors, it can be done with a box cutter and quarter round at the base of the hearth. From the plywood sheet, my husband cut out the piece for the top of the hearth. Then, we (and by we I mean they) laid it out on the hearth frame. It lined up perfectly! Then nailed the hearth top into the frame base. 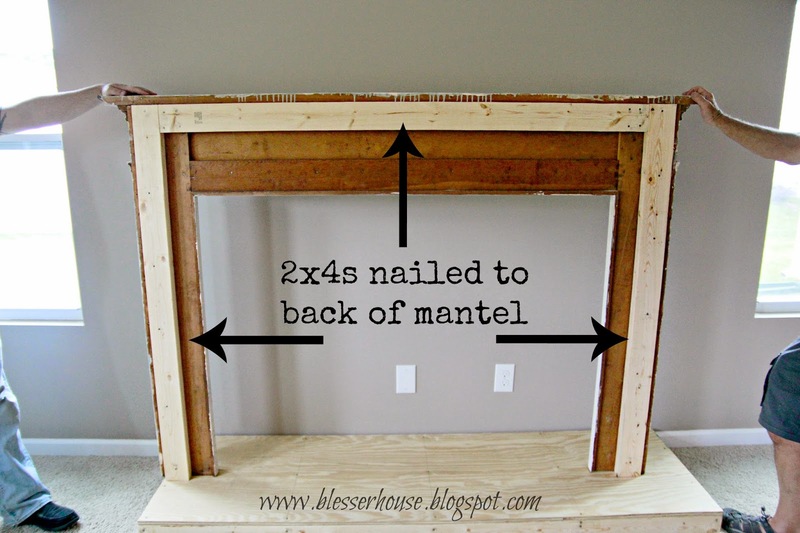 For the mantel, we nailed in 2x4s inside the back of the frame to later use as an anchor to the wall. Then, we nailed up 2x4s at the same height as the mantel back. Then we cut plywood strips to screw onto the back of the mantel to anchor the surround that would come next. We used a piece of plywood over the mantel opening to make into the surround. We used drywall screws to fasten the plywood to the anchor strips from the previous step. Here’s where our faux fireplace becomes a bit more than a faux fireplace. We wanted this space to still be useful, so we put in a door to fake a firebox and have access to our outlet on the wall behind the fireplace to run our cords out of sight like a media cabinet. We measured the faux firebox door and left a little space at the bottom to create a threshold and prevent the surround from bowing. We switched circular saw blades to cut out the door to one that was thin and would be precise. My father-in-law did the honors of this part. For the corners, he used a jigsaw to make sure each cut was exact. To create the firebox door, we screwed a piano hinge into the surround piece. We cut it to size first using a hack saw. To make sure the door wouldn’t cause any bowing or movement in the surround, we made a door frame on the back of the mantel. We shaved off just a teeny tiny bit of the door, and it fit like a glove once attached to the piano hinge. After the two plywood sidepieces were up, this is what the top looked like. See the outlet down there? Because of the firebox door, it’s still usable. To close in the top, we added a plywood piece and attached it to the 2x4s on the mantel and wall as well as the plywood side pieces. That thing was going no where! We laid down one more plywood piece on the top and mimicked the end molding of the mantel shelf. Robert secured it with finishing nails. We decided how wide we wanted the plank wall to be (big enough to incorporate that monstrous TV that Robert is bonkers for). We used a level to draw a pencil line from the top of the mantel to the ceiling as a guide for either side of the wall. Then, we used the level again to draw a pencil line for each stud in the wall. Once the studs were marked, Robert started on the 1×6 planks cut to size based on the measurements we decided on for the width of the wall. We used finishing nails on each of the studs for each plank and made sure to keep the planks lined up on the ends we had marked before. Okay, we’re not THAT frugal, but I already happened to have popsicle sticks and they were the first things I thought of. For the last plank, we had to cut it by about an inch to make it fit. Once all of the planks were up, we nailed a 1×4 over each end. We later put a small molding piece beside each of the 1x4s too to completely hide the plank ends on the sides. This part made me cringe…drilling a hole into our pretty new wall! But this is partly an entertainment center after all. I would have loved to figure out a way to put the TV on another wall but there is no other place in our living room that would work. We drilled all the way through to the stud for the TV mount to be sure it would stay in place. To run the cords straight down from the TV (and this is the advantage of a faux fireplace), we drilled a hole at the back of the mantel shelf using a hole saw drill bit to run TV cords to the outlet. We won’t have to deal with cords running around the room. And now she’s ready for paint! We painted two coats on all of the places on the fireplace with the Pure White that wouldn’t be covered with stone. I happened to already have some chalkboard paint in my craft stash, so I painted the firebox door with two coats. Then, I dry-fitted some of the AirStone for the hearth. I numbered the ends of the AirStone blocks so that I could put them back together later. I chose to whitewash the hearth AirStone in the garage and attach them later so that I wouldn’t have to worry about getting whitewash on our floor. To make the whitewash, I mixed 1 part of the white paint with 1 part water in a bucket. Then brushed the whitewash onto the AirStone. I let the whitewash soak in for about a minute before dabbing off the excess with a rag. Once the whitewash was soaked in and dry, this is what the AirStone looked like. There’s just enough of the gray peeking through. Then, we fitted the AirStone back together around the hearth. We applied the adhesive like frosting on a cake and pressed onto the hearth frame. The great thing about AirStone is it’s only $50 per 8 square feet of coverage, and no power tools are needed to cut them. All we needed to cut the stones to fit them was a hack saw. Then, we fit them onto the bottom surround. To mimic a concrete hearth, we used concrete patio stones secured with the AirStone adhesive. We continued adding the AirStone and worked our way up around the firebox door. We used popsicle sticks as spacers to keep the stones level since some of them were not perfectly straight. When we got to the top, we had a small space left and AirStone is nearly impossible to cut lengthwise, so we added a small strip of molding to paint white later. Adding the popsicle stick spacers gave us enough wiggle room. We added the AirStone to the sides of the fireplace as well. Using the same mix of whitewash as I did on the hearth, I applied it to the rest of the AirStone and dabbed off the excess. And I painted the patio stones on the hearth with the sample pot of Valspar Rugged Suede. I later went back over the stone with a second coat. At this point in hindsight, I realized that I would rather paint the AirStone white than live with the whitewash, but that was a personal preference. So I ended up painting it all white, but it’s better to try whitewash and paint after than to paint and wish you’d tried whitewash. Once you paint, there’s no going back. To put the finishing touch on the fireplace, we cut a log (free from our in-laws’ wooded backyard) to be two inches long so the slices would look deep enough to be more convincing of a real log stack. My father-in-law did the handy dandy cutting for us on his band saw. We detached the firebox door from where it was attached to the fireplace with a piano hinge and laid it flat. I had already painted it with some leftover chalkboard paint. Working with the log pieces was actually fun! It was like a giant puzzle and only took me about an hour tops to get it the way I wanted it. Don’t try to glue the pieces as you position them because I had to rearrange them as I worked. I left about an inch of space on the left side to account for the hinge and opening the door later. I glued down all of the pieces with Gorilla Glue once I was happy with the positioning. Once we screwed the firebox door back on the fireplace, we realized the door was too heavy to constantly open and close as we accessed our electronics from inside of the firebox, so we chose to keep them on the mantel instead until we could figure out a better solution. But we can still access the outlet. And that was that! Our living room officially had a fireplace! Okay…. now that you are all positively drooling over Lauren’s fabulous faux fireplace (WOW!!! ), put your tongue back in your mouth and run over to Bless’er House to see more from Lauren. I suggest you try the faux reclaimed wood tabletop and faux planked bookcase, but it’s hard to go wrong with budget industrial light fixtures — and I know you’ll appreciate 8 ways to make the most of having NO money for home decor! PS: subscribe to follow us by RSS or email so you don’t miss a single one of our amazing holiday guests! Thank you SO MUCH again for having me! I am so inspired by this blog constantly, so it’s an absolute honor to be featured. Hope you have a wonderful New Year! Thank you for being our guest, Lauren! We LOVE this!! Oh, and I’m happy to answer any questions if anyone has any at some point. Lauren – This is FANTASTIC!! I’d love to know how you’ve hidden your components though. Where is your satellite/cable receiver hiding?!! Thanks so much, Emily! I actually got a little sneaky with the decor on the mantel and used vintage books to disguise our box there. I’m working on a better solution, but for now it doesn’t bother us too badly on the mantel. Hello. How beautiful. What is the width height of the side plywood pieces? Great job, Lauren! It looks amazing! Lauren I absolutely LOVE this! We are always wishing we had a fireplace. Great job explaining the steps. Wow! What a fabulous DIY fireplace makeover! Amazing! Love Lauren’s blog and so glad to find your blog now as well 🙂 One of my favorite projects we tackled this year was our fireplace as well! Happy New Year! So glad you found us, Kendra! Happy New Year! Looks amazing! Do you think instead of a door I could stick an electric fireplace insert? Thanks! I’m no professional on this, Monica, but I would think since electric fireplace inserts are typically housed in wooden fireplace boxes and cabinets, it would be safe. It’s generally the same concept. We might take that route down the road, but it really doesn’t get cold here (it’s 60 degrees in December here right now) and we wanted to keep our spending as low as possible. If we attempt it, I’ll try to post an update. Hope that helps! We live in Chicago, so electric fireplace would come in handy 😉 Thanks and Happy New Year! If there’s one thing I’d like out of my living room, it’s the fireplace. I don’t like having to arrange my furniture around it and I don’t like the tv above the mantle. Think about your furniture arrangement before you add even a faux fireplace. Gotta say, I agree. We have a wood burning real fireplace, unusable for the last 15 years due to needing a chimney liner. Our LR is not as large as this one. Placing the television over the fireplace would not work, since we would really be staining our necks to watch it. Honestly, I think that in this LR, although it is larger than ours, they would have the same problem. They did a beautiful job. I would be uncomfortable watching TV at that height. Beautiful job!!! So much work. You could re-do the door in two pieces, or hinge the bottom instead of the side with chains for support so it drops out like a draw bridge. Thanks for the link, Angelina! We moved so we are on to different remodeling challenges in a new house now 🙂 but that remote sounds awesome! my head just exploded! this is sooooooooooooo wonderful! Proud of y’all! How do the wood slices hold up over time? I love the fresh cut look but do they grey over time? Did you seal them with anything to maintain their color? Thanks! We’re going on 10 months since we built it, and the wood slices look just like the did on Day 1. 🙂 But you could definitely seal them with a matte polyurethane if you wanted. That might be a good idea for ours actually if we ever do notice the wood aging. I’m curious why you chose chalkboard paint. I was expecting to see a cute chalk drawing of a fire at the end, but then you covered the whole thing with logs (not that the logs don’t look lovely, because they do). Love this! Will you please share the overall dimensions (including debth for the hearth)? When searching for the mantel – what did you search on craigslist? Hey! This looks great. How many boxes of airstone did it take? Looks great!! What are the dimensions for the space you cut out of the plywood? Looks awesome, where you used popsicle sticks, what did you use to fill the gaps?